Our client had in-licensed a new patient-focused tool for use during treatment for a mental health disorder, as a complementary offering to their existing CNS franchise. The tool offered potential added value through reducing the direct and subsequent indirect costs of overall treatment. In order to define launch countries, our client required a comprehensive analysis of the market to determine the level of commercial opportunity. We conducted a landscape analysis including a structured and grey literature review, as well as a local language literature review to ensure all relevant data were identified. A gap analysis of the initial findings was conducted to highlight any further research required. 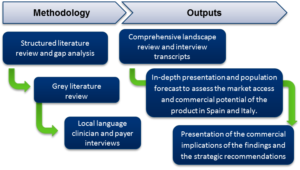 Local language clinician and payer interviews were carried out to gain a real world perspective of treatment and to determine the probability of uptake. We then analysed the results and presented findings in a report with strategic recommendations and a population forecast. Estimates of prevalence and a population forecast for each country. The level of competition in each country. Existing treatment guidelines and their use in real world practice. The challenges surrounding reimbursement in each country. Clinician and payer insight on the market and opinions on the tool. The commercial opportunity and key considerations for market entry in each country. As result of this study, our client was able to use our strategic recommendations for their overall commercial development plan. We provided a robust evidence base for the client to decide a ‘go/no-go’ decision for the tool in Spain and Italy.